Standing Celtic cross garden stone features the Irish blessing and it is enhanced with shamrocks. The Irish blessing on the Celtic cross garden stone reads: May the road rise to meet you. May the wind be always at your back. May the sun shine warm upon your face, The rains fall soft upon our fields and, Until, we meet again, May God hold you in the palm of his hand. This Irish garden statue features a dimensional Celtic cross and it is enhanced with shamrocks and Celtic knots. 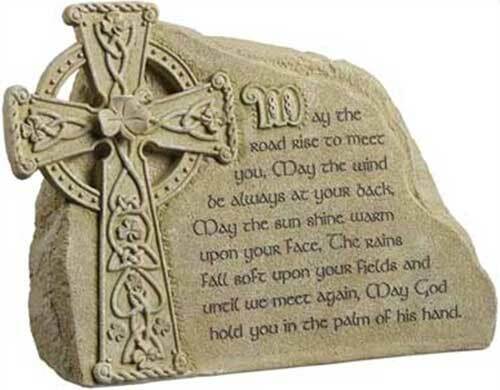 The cement and resin garden stone also features the traditional Irish blessing; it is suitable for outdoor use. The Celtic cross stone measures 9" wide x 7 1/2" tall x 4 3/4" deep and is gift boxed with Celtic knot, Celtic cross and shamrock history cards, complements of The Irish Gift House.